Pricing at BPI Labs is a multi-phase approach that occurs during the development of a custom product for your brand. Variables that affect the cost of your product include the materials used in your formulation, the difficulty of obtaining and using packaging to fill your product, and the volume discounts we can apply to your orders. This article will help you use these variables to your advantage so that you can have a personal care product manufactured at a price point you love. Our customers are making decisions at each step that influence their final product’s price. We work with you to develop a product at a price you’ll love, but being aware of these choices ahead of time will help you work on multiple and parallel activities while zeroing in on your pricing goal. The best objective you can meet prior to attempting any of these other recommendations would be to have a price point in mind. BPI Labs will work to meet that price point so long as we know what it is ahead of time. This will require you to know at what price you want to sell into the market, less your needed margin and cost of shipping to your preferred location. The remaining factors can be carefully adjusted to generate your optimal price point. There is significant flexibility in pricing in the formulation of your product. Generally, the greater percentage of water present in a formulation the cheaper the materials costs will be for manufacturing. Water is one of the cheapest ingredients that can be used in a formulation, and it is certainly an essential ingredient for personal care products in most cases. Our customers, who compete on price, run into difficulty when they would like to include in their formula expensive ingredients at greater quantities than competing products. Examples of expensive ingredients include: fragrances, essential oils, OTC drugs, rare ingredients from limited sources, and premium ingredients, like materials with advertised anti-aging properties. Our customers, who compete on price, run into difficulty when they would like to include in their formula expensive ingredients at greater quantities than competing products. The materials price does not need to come as a shock, however, since BPI Labs can create a formulation and price it simultaneously. We’ll notify you of the bulk-material price after you’ve approved a sample. The bulk-material price is the cost involved in just the material acquisition and compounding, and this is your manufacturing price if you will not have BPI Labs filling your product. If you do not like this price then we will iterate on the formulation until you have satisfactory price or until we don’t believe the formulation can be feasibly altered any further for cost savings. There are two important considerations when it comes to packaging. First, how would you like to have your packaging purchased and shipped? BPI Labs can provide a turnkey service where we will source, purchase, and store packaging for your orders. This comes with a 20% additional cost on the packaging after it has arrived at BPI Labs. However, our customers tell us it is worth the cost if they don’t have to arrange logistics, arrange tracking, and tie up their cash in packaging. Alternatively, our customers can source, purchase, and ship packaging to our location. However, many jobs over the years have been delayed because a customer forgot to purchase and have shipped an essential packaging component. See our post on turnkey manufacturing here to read about the options. Second, packaging that can’t be used on automated machinery will create bottlenecks that slow production speed. Special stickers, brochures, or any hand-applied packaging components increases the amount of time to complete a job. This, in turn, increases the amount of direct labor required to finish your job. The metric we use to determine direct labor is pieces-per-minute (PPM). This metric is the number of finished goods we complete every minute, and the higher this number the faster we’re completing the job. Using packaging that works on automatic machinery improves the PPM and decreases the cost of your job. Volume discounts have a cascading affect, and they’re most important to consider with smaller orders. Shipping, materials, and fixed costs all dramatically decrease on a per unit (finished good) basis as your order size increases. BPI Labs’ volume discounts also increase to our customer. But by how much? In 2018 we did a small study of how the cost-per-piece of finished good goes down with every increase of a thousand units ordered. We looked at over 150 products we priced over the last couple of years. The results suggest that you’ll see dramatically increasing cost savings up to 20,000 units. These prices don’t reflect the cost of shipping finished goods from our factory to your preferred destination. Graph Above: The horizontal X-axis shows the number of units ordered. The vertical Y-axis shows the decrease in percent on average for all products we produce from an initial order of 1000 units on a per unit (finished good) basis. I.E. A shampoo at 1000 units could have a 75% decrease in per unit cost at 20,000 units. It is important to interpret the graph accurately. Every point on the graph is an average price paid for all products, which means individual product categories might vary significantly in price at different order volumes. When looking at specific product categories, such as lotions or creams, there is a significantly greater degree of variance than there might be for salts or powders. The fact remains that our customers can choose to have either a cheap or expensive product made at BPI Labs. 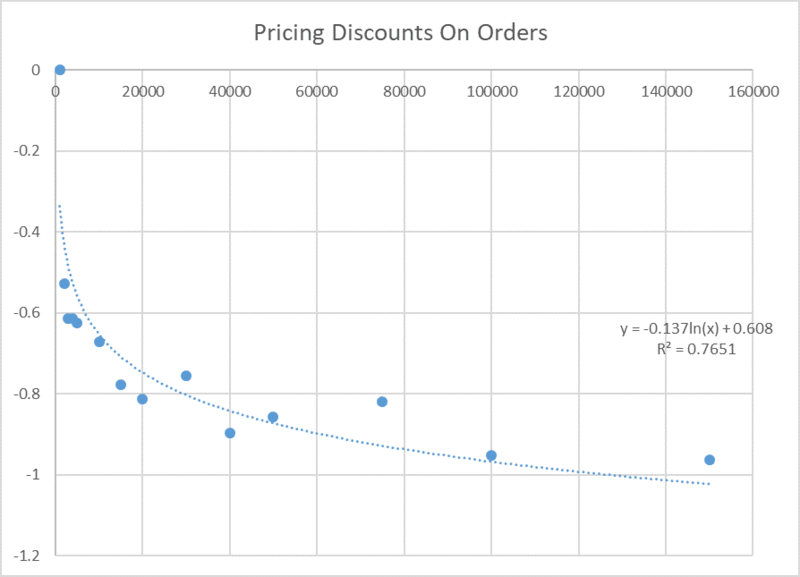 But the graph does show that no matter how expensive your product might be, it’ll be cheaper to purchase if you order more product per order and by a significant degree up to about 20,000-40,000 units. There are three primary factors influencing your product’s price. The cost of materials, obtaining and using packaging, and order volumes. What this article did not discuss is the cost of packaging and how BPI Labs’ relationships with packaging vendors might reduce your overall packaging cost. Read this case study to see how our volume discounts reduced a client’s overall price-per-piece. BPI Labs only recoups its costs when its customers are successful in the market. We’re highly motivated to manufacture a product for you that has market staying power, and that must be a product with margin you love.